This entry was posted in Community, General News and tagged Southeastern Raptor Center on November 8, 2013 by Wire Eagle. AUBURN UNIVERSITY – A collaborative effort between Auburn University and construction professionals will allow visitors to the Southeastern Raptor Center to have better and safer viewing of birds of prey from an environmentally friendly walkway. Students in a Structures III class taught by Michael Hein, a professor in the McWhorter School of Building Science, working with Auburn Facilities Division and private contractors, prepared the site and placed the more than 300 linear feet of pervious concrete – a material that supports load while it allows water to pass through and reduces the environmental effects of stormwater runoff. The walkway is behind the bird mews at the Southeastern Raptor Center, a division of the College of Veterinary Medicine at Auburn University. 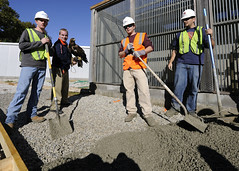 In addition to about 30 College of Architecture, Design and Construction students, Facilities Division employees and construction professionals, the work has been under the watchful eye of 26 birds of prey, including War Eagle VI, known as Tiger; War Eagle VII, known as Nova; and Spirit. Dale Fisher with the National Pervious Concrete Pavement Association, who is considered by industry executives to be the creator of pervious concrete, was on hand to oversee the project. “I came to help with the logistics of the job because it is one of the most challenging, if not the most challenging, pour we’ve ever done because it is angled, narrow and we’re pouring against concrete block,” Fisher said. The idea to replace the current gravel walkway was that of Southeastern Raptor Center staff members Marianne Hudson and Andrew Hopkins, who conduct numerous private tours of the center. “The gravel has caused issues for the disabled, those with strollers and the elderly,” Hudson said. Hopkins was walking with a friend in the university’s Davis Arboretum and learned about pervious concrete and began conversations as to the best way to pave the area at the Southeastern Raptor Center. “We’ve wanted it done for years because we average about one private tour each week and we have had challenges walking behind the mews,” Hopkins said. Although pervious concrete has been around since the 1970s and is considered a Best Management Practice by the EPA, it is not a widely used material in Alabama, so students will learn information they can take to the workforce. Over the past 10 years, Hein and students in his previous structures classes have used the material on several campus projects, including parking lots and more than 1,000 linear feet of walkways in the arboretum. Pervious concrete is a mixture of coarse aggregate, Portland cement and special admixtures. The stiff mixture is deposited and compressed with a spinning roller. The result is a high permeability concrete that supports loads and drains quickly. University Facilities has played an important role in the project, with staff and equipment being used. Several corporations are also involved, including The National Pervious Concrete Pavement Association, Alabama Concrete Industries Association, Ready Mix USA Concrete of Opelika, FORTA Corporation and Estes Landscape Design.